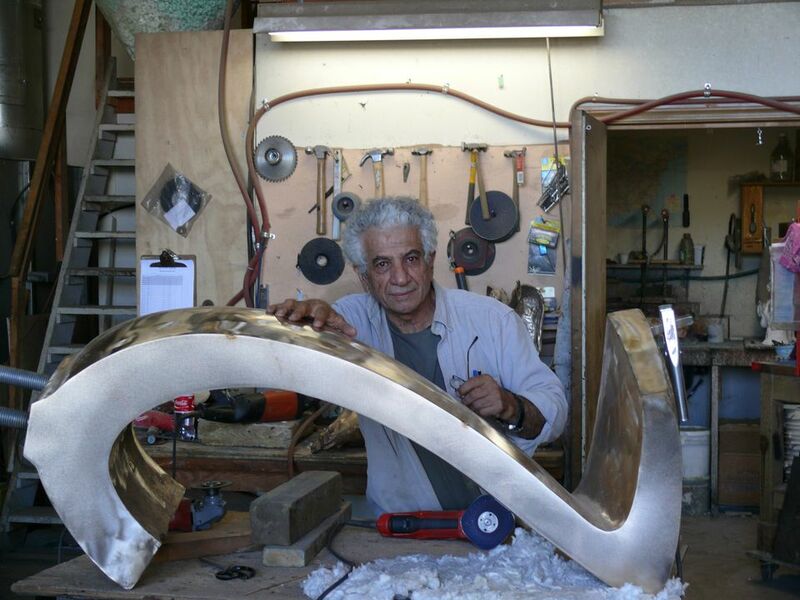 The Iranian artist Parviz Tanavoli has been prevented from leaving his home country after a Tehran art dealer brought lengthy legal proceedings claiming $6m worth of art from him, the artist tells The Art Newspaper. Tanavoli tried to leave Tehran Airport in late July on a British Airways flight to London but, after he checked in and his bags were boarded, his passport was confiscated by Iranian authorities. He was informed that a travel ban had been enforced against him on charges of “the spreading of disinformation”. The case was brought against Tanavoli, who holds the auction record for a Middle Eastern artist, by a former Tehran gallery owner, Maryam Goudarzi. Accounts of the complex proceedings, which date back to 2014, have been reported on the popular Iranian newsite, Tabnak, and in an online petition launched by Tanavoli’s students. Tanavoli says he has now learned this ongoing legal dispute was the reason he was previously prevented from leaving the country in 2015. In 2017 the case brought against him by Goudarzi—centred on a disputed contract from around three years ago agreeing to swap six copper sculptures by Tanavoli, owned by Goudarzi and dating to 1972, for five more recent works by him—was thrown out by a lower court. However, after several failed attempts by Goudarzi resurrected in a court of appeal without the artist’s knowing, he says. "We went to court and I won the case but in my absence the woman went to a superior court and then she got me into trouble,” Tanavoli says, adding that Goudarzi was using the case to “intimidate” him. The 81-year-old artist lives for most of the year in Iran, where he teaches and has a studio, but in the summer he typically travels to Europe and Canada to see his family. He was planning a trip to Vancouver, his second home, where he is also preparing for an exhibition at the Art Gallery of Vancouver. Tandis Tanavoli, the artist’s daughter, has suggested the case would be a “disaster for art in Iran”, and could open up decades-old deals to the possibility of fraud proceedings. In response, Goudarzi tells The Art Newspaper: “Fortunately I won after a very long and painful process. Tanavoli is bound to restore [to Goudarzi] the six pieces in conflict, or pay for the financial value”. She calls the artist “criminal” and suggested the seizure of the property was imminent. “It’s not a very complicated thing to need all this controversy" she says. The case, according to details in Tabnak and provided by Tanavoli and his assistants, began about three years ago when Goudarzi approached the artist saying that she had bought six of his early copper sculptures for IRR8000,000,000 (about $270,000) for her collection but had not been able to sell them. The six works dated from 1972, before the Iranian revolution, and had originally belonged to a wealthy family whose home was confiscated by the government and then demolished. Titled Three Girls and Three Boys, it appears they are actually sections of a single wall work. Goudarzi first asked Tanavoli to buy the sculptures from her, but instead he proposed exchanging them for more recent works. A contract was signed to exchange the six copper sculptures for five new works. It is claimed she later returned to court saying that the substitute works were worth less, and that she had buyers for the original six sculptures so wanted them back. The appeal court ruling against Tanavoli reads “…dissimulation and fraud is evident and proved in this case” and states he must return the artworks, valued by the court at $6m. Goudarzi signed the original contract with her partner Amir Bahman Amirian, who founded the Iranshahr Gallery in Tehran. He tells The Art Newspaper he had no involvement in the case.